Liviu-Stefanita Baiu, Senior Business Analyst and Analysis Discipline Lead, has worked as a full-time Business Analyst for the last 5 years, in a couple of companies, in an Agile environment. 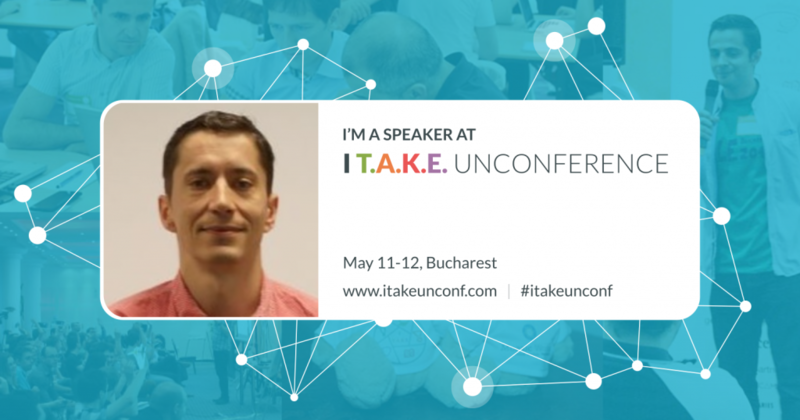 He will share at #itakeunconf real-life samples of the techniques and tools and how they helped get along in Agilandia. Some of the most important turning points in my professional life are related to the people – my family and people I’ve met and work with along the way. √ The set of values I learned from my family is the basement for all I am today, and I will name only a few – fairness, transparency, and loyalty helped me get through various situations I encountered. √ Along with the above values – assuming responsibility for the things I’ve done allowed me to become trusted and receive honest feedback about my activity. Getting the right feedback (positive or negative – we all have successes and fails) and learning from it – this is something of value for me, and I try not to repeat the mistakes I’ve made along the way. √ I like to read and I was encouraged to do so – this got me to pay attention to details and try to see beyond words and facade. √ Making a career switch, thirteen years ago when I joined Transart, was a turning point. And the things I learned there for almost seven years, allowed me to naturally evolve to become a Business Analyst. √ The colleagues and superiors I had, in my previous employments, contributed something to my evolution – their appreciation, as well as their disapproval, and always their advice. My session is nothing about panacea, rather a proposition for the participants to use a set of tools, techniques, and attitude to tackle the complexity of software projects in an Agile environment. Some of them tools will help them understand the product vision, and other can be used for passing it on to the teams they work with. The match between them and each participant’s work environment as well as the value they bring in everyday work is a decision that relies solely on each and everyone from the audience. This toolkit worked for me, it may work for others. I play GO (or wieki) – an ancient Chinese strategy game – unfortunately less often, I enjoy reading Fantasy and Sci-Fi literature, but one of the books I enjoyed reading is a military treaty – Sun Tzu’s Art of War, and one of my favorite authors is Mario Vargas Llosa, from a professional perspective Patrick Lencioni – The Advantage was an inspiration. And to conclude – the best source of information is the team you work with, they will show you what you need to learn so you can work together. Want to join Liviu and ~300 software crafters from around Europe?